One of the final Ironman races of the season, Ironman Cozumel, took place over the weekend. 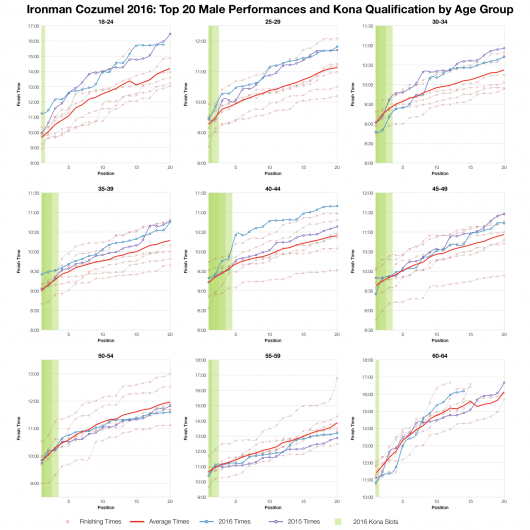 It’s a mid sized race with around 1,400-1,500 athletes competing for the standard 40 Kona slot allocation. Conditions, and with them finishing times, have varied a lot in Cozumel – there have been some particularly tough swims and bikes in the past. It’s not a race to pick if you’re looking for fast times, race day can be challenging. The biggest difference in split distributions this year is on the swim which was much slower than usual. Cozumel has seen slow swims before and also some very fast swims too – it’s worth remembering that the 7 year aggregated results contain a lot of variation. 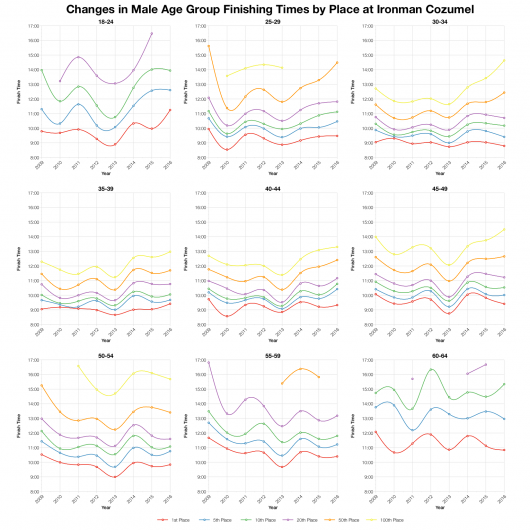 Bike and run times don’t differ by much, at a push 2016 is slower in each, but it’s marginal. 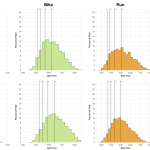 The net outcome is a slower overall distribution at this year’s race with a heavier back-of-pack presence. As with conditions, DNF rates at Cozumel have varied a lot and tended to be quite high. 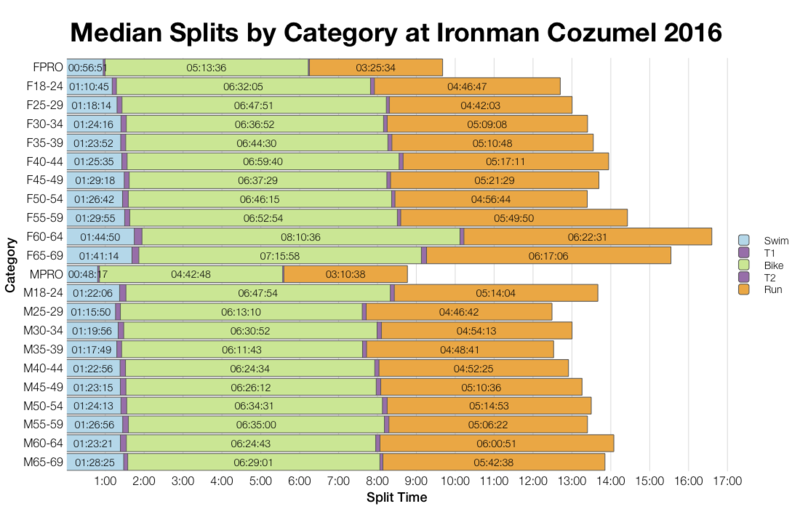 There is an element of DNS data in some of the counts, but even allowing for that Cozumel has had some of the higher DNF races in Ironman. With that in mind this years race is typical of Cozumel, it’s not extreme for the course, but it’s high compared with many of the European and US Ironman races. 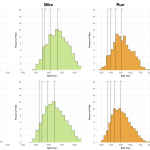 The medians follow the trends shown in the distributions: slower swim medians with bike and run not too different to the past. 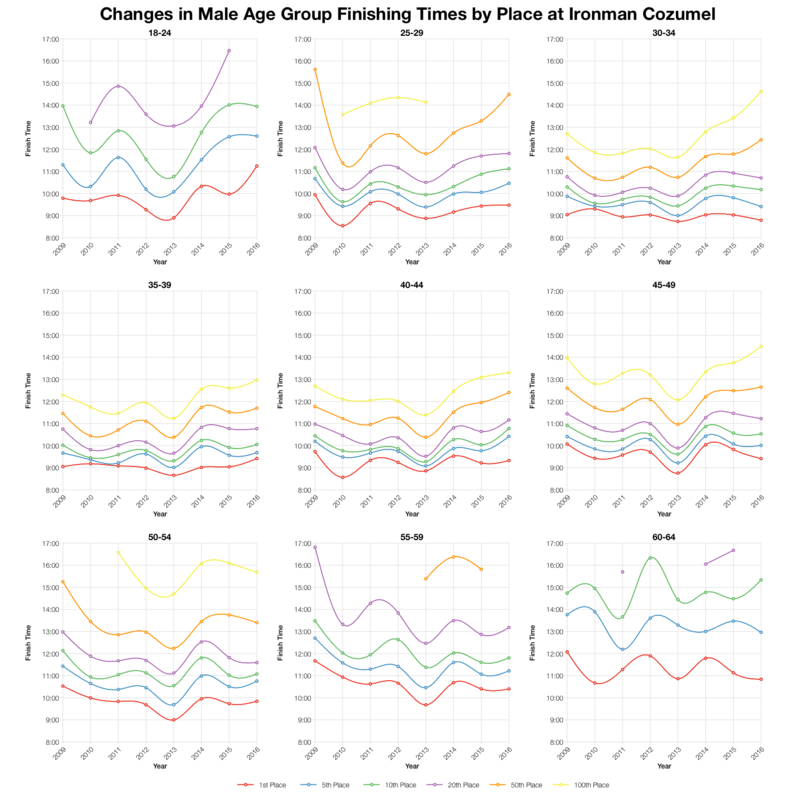 There’s variation between division of course and Pro times trend faster this year than the previous aggregate. Mexico and the US are nearly tied on numbers at Cozumel. Beyond this pair there’s a mix of nationalities filling out the top ten. 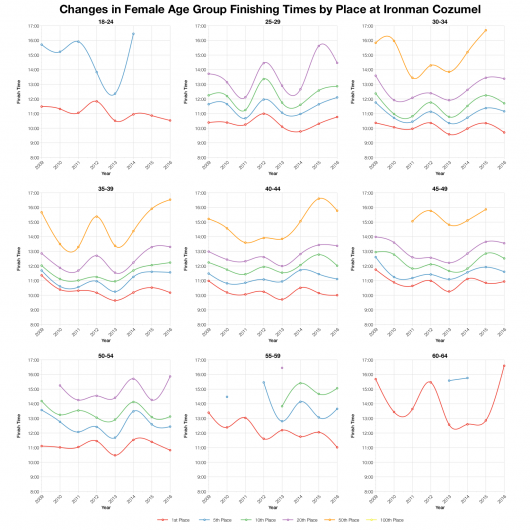 Tracking the finishing times for different age group positions over 8 years highlights the variance in race conditions. The peak performance, in 2013, featured a shorter swim among other things. Otherwise there’s been year on year variation after a slow debut back in 2009. 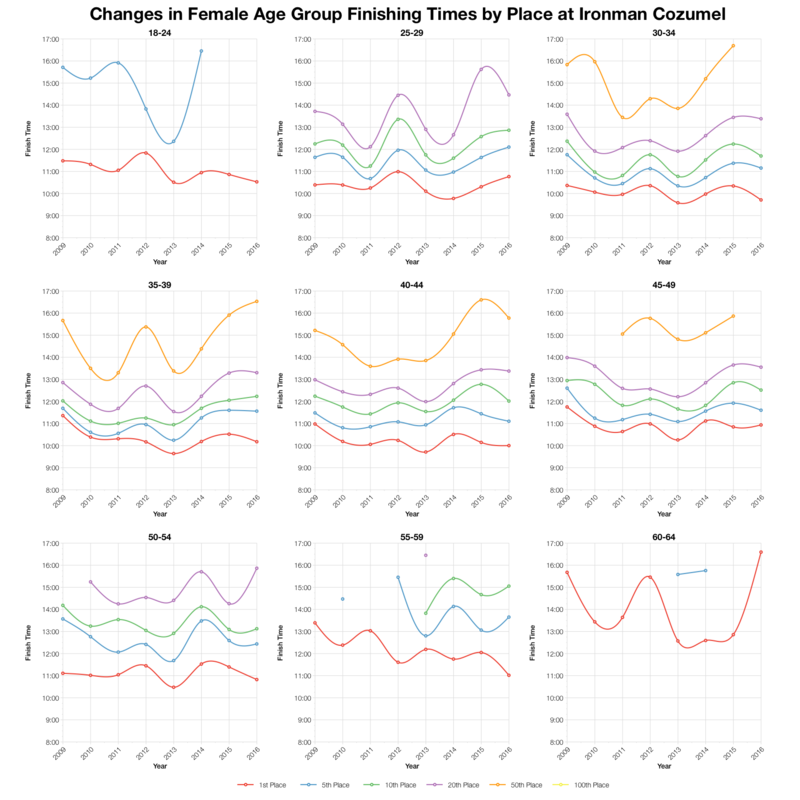 This year’s race falls somewhere in the middle to slower end of race years, although that does depend on the age group we’re examining. 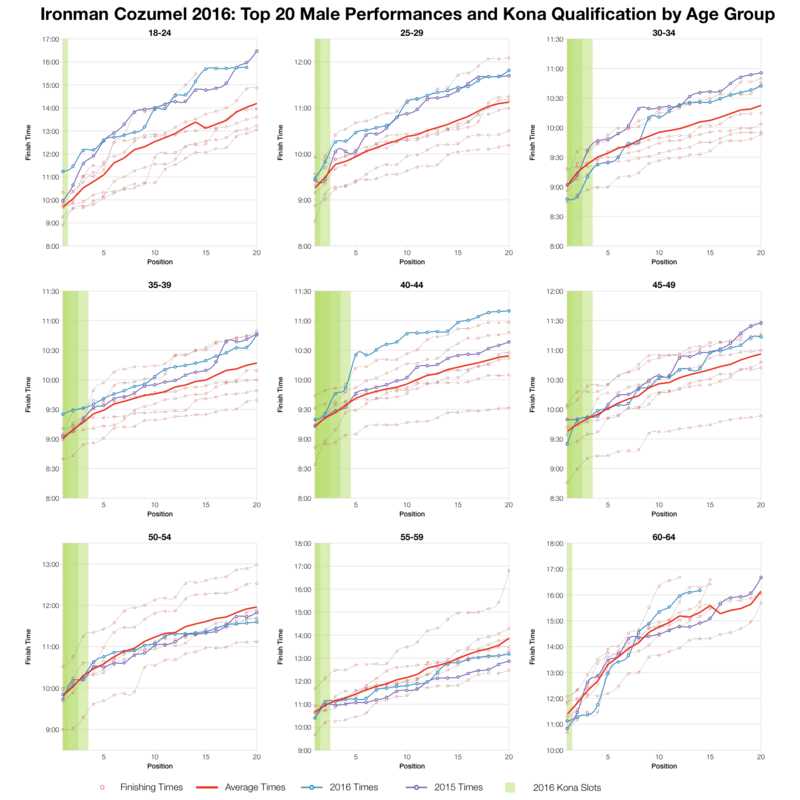 I’ve calculated the slot allocation for Cozumel based on the athlete trackers list and from that the automatic qualifying times in each age group. The actual allocation may vary based on final start numbers and times will depend on roll down. You can compare Cozumel with other Ironman races on my Kona qualification page. Using the slot allocation I’ve also determined the nationalities for the automatic qualifiers in the table above. It’s a strong showing for the US, Canada and Panama with Mexico itself claiming few slots. 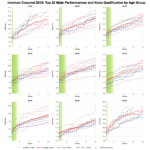 Front of pack athletes, those chasing the podium and Kona slots in particular, tend to show the least variation in the face of changing conditions. 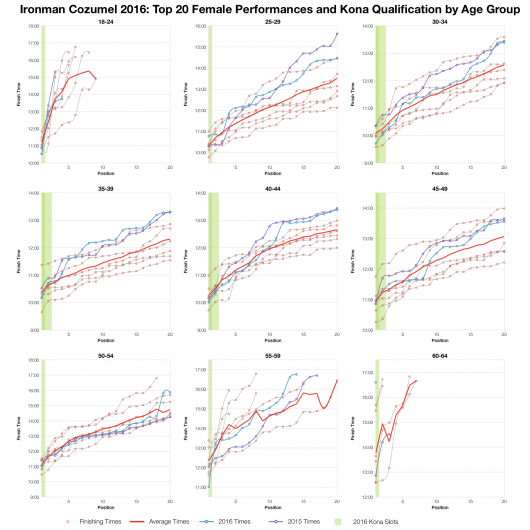 Looking at the age group top twenties this year suggests the course was slightly slower than average as that’s the pattern we see over most age groups. In some instance it seems much slower – most of the M40-44 division for example – and in rarer cases slightly faster. Those at the very front of the race come out close to average. You can access a spreadsheet of the full results and splits from Ironman Cozumel 2016 on my Google Drive.